A number of bilateral agreements will be signed during the three-day visit of Mozambican President Filipe Nyusi, who arrived in Rwanda yesterday. This was confirmed on Thursday by Olivier Nduhungirehe, the State Minister in the Ministry of Foreign Affairs, Cooperation and East African Community. Rwandan officials and their Mozambican counterparts yesterday concluded a two-day meeting of the Joint Permanent Commission of Cooperation (JPCC) between the two countries, which aim at thrashing out the areas of cooperation before the bilateral agreements can be signed. Nyusi arrived in Kigali yesterday in a reciprocal visit following a similar trip by President Kagame two years ago. Nduhungirehe said: "We have just ended a two-day JPCC. It's an important visit that will help strengthen our bilateral relationship. A number of agreements and MoUs will be signed during the visit." 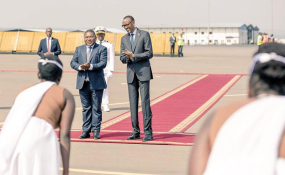 When Kagame, in 2016, visited the Southern African country, the two Heads of State held bilateral talks prior to the signing of a Memorandum of Understanding on cooperation in the area of political consultations between the two countries. At the time, Rwanda's Minister for Foreign Affairs, Louise Mushikiwabo, noted that the visit bilaterally signalled the stepped-up collaborations and closer ties. Mushikiwabo and her Mozambican counterpart, Oldemiro Marques Júlio Baloi, signed bilateral agreements at the time. The minister also noted that they took the opportunity to thank the government of Mozambique "and to very happily hear from the President of Mozambique that this friendly country" will not allow any acts of destabilisation of Rwanda by some elements in the Rwandan community in Mozambique. Also under discussion is for the national carrier, RwandAir, to commence flights to the Southern African country. On Thursday, Rwanda's High Commissioner to Zambia, Monique Mukaruliza, who also covers Mozambique, said: "We have more than 4,000 Rwandans living in Mozambique and strengthening the bilateral cooperation between Rwanda and Mozambique benefits Rwandans doing business in Mozambique." "The interaction of the Rwandan business community with their Mozambican counterparts during a business forum that will be held during the state visit will facilitate both sides in doing business in both countries." During his 2016 visit, Kagame addressed members of the academic and business society in Maputo and emphasised that the private sector must play a key role, alongside government, to ensure mutually beneficial partnerships. This, he said, promotes social and economic prosperity. The ongoing visit by the Mozambican leader, Mukaruliza said, also serves an important purpose of opening borders to Rwandans that need to expand their activities in foreign countries. She termed it as a "Rwanda connection to SADC countries." The 15-member states Southern Africa Development Community (SADC) is an inter-governmental organization headquartered in Gaborone, Botswana. Speaking to The New Times, Justice Minister Johnston Busingye said that cooperation in justice is a key aspect of the Kigali-Maputo relationship. "Not only on the usual activities; professional growth, capacity building, exchange of experiences, but because this whole geographical space is increasingly getting connected by trade, travel, investment, tourism, it is important that law enforcement, tracking of offenders and fugitives from justice, exchanges of prisoners also get connected to ensure that the rule of law governs this growing environment." In particular, he said, Rwanda has evidence there is a number of Genocide fugitives in Mozambique. "The evidence is so credible that we sent about six indictments already. So, cooperation in justice is a key aspect of our relationship."